Sweetwater Creek Animal Hospital is a full-service veterinary medical facility located in Lithia Springs, GA. 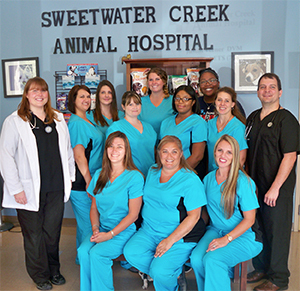 The professional and courteous staff at Sweetwater Creek Animal Hospital seeks to provide the best possible medical, surgical, and dental care for their highly-valued patients. We are committed to promoting responsible pet ownership, preventative health care, and health-related educational opportunities for our clients. Sweetwater Creek Animal Hospital strives to offer excellence in veterinary care to Douglasville, Lithia Springs, and surrounding areas. Please take a moment to contact us today to learn more about our veterinary practice and to find out how Sweetwater Creek Animal Hospital can serve the needs of you and your cherished pet. Ember has been with SCAH since our opening in 2008. Serving as office manager gives her the opportunity to combine her two passions of serving people and caring for animals on a daily basis. Ember enjoys being office manager here at SCAH because she is always learning something new and each day is different from the last. At home, she has three Boxers, a Frenchton, and a Fox Terrier in addition to her four cats. Ember enjoys spending her free time camping and spending time on the lake with her family. Katie has been a part of the SCAH team since 2011 as a veterinary assistant. She also recently took on the responsibility of Kennel Manager. This new role gives Katie the opportunity to work even closer with your pet while he or she is with us at the clinic. Her goal is to assure you that you can be confident your pet will be well cared for during their stay. Katie enjoys working with the wide variety of patients we see, including our exotic and wildlife cases. At home, she is the mom of twin boys and a sweet Pit Bull named Mopar. Katie and her family enjoy spending time outdoors. Mylinda has been at SCAH since 2008. She has always enjoyed how each day is different here at the clinic. Mylinda assists our veterinarians in all aspects of patient care and treatment, including surgery and recovery, dental procedures, and radiology. She has ten years of experience as a technician with three years in emergency medicine. Mylinda is married with three children, five cats, three dogs, a rabbit, and a Ball Python named Martha. Lee joined the practice in June 2015 with almost 4 years of experience in this field. Even though Lee is new to our practice and still getting used to everything, she says she enjoys being a part of our team and meeting all of our clients and their pets. Lee was born in Hawaii and is a big sports fan. Her favorite teams include the Duke Blue Devils, the Denver Bronocs, and the Ohio State Buckeyes. Lee used to volunteer at an animal shelter and has a special interest in animal care and safety involving domestic animals and wildlife. At home, Lee has a 10-year-old Labrador named Aaliyah. Kristie has been with us since July 2009. She enjoys having the opportunity to greet everyone by being one of the first faces clients see. Kristie enjoys learning about all aspects of animal health, but she does have a passion for our feline patients and their specific healthcare needs in particular. Kristie is married and has one daughter. As a family, they enjoy camping, vacations, and spending time with one another. She shares her home with a Golden Retriever named Kanga and two kitties named Katniss and Fritz. Sommer joined our team in 2008. She says her favorite part of working here is the “puppy kisses” and the opportunity to interact with a variety of animals. As a client service representative, Sommer is able to work within all aspects of the customer service field. She has a son and a sweet little Chihuahua named Tyrion. Andie joined our team at the beginning of 2015. She has really enjoyed having the opportunity to learn about the special health care needs of our exotic and wildlife patients. Since joining us, Andie has worked in almost all aspects available at our clinic, in everything from kennel maintenance to assisting the veterinarians with patient care and as a client service representative. Andie has a son, a Great Pyrenees named Willow, and three cats.